A preview of tonight's Buffalo/Toronto game. 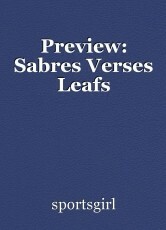 The last time the two teams met on March 26, the Buffalo Sabres defeated the Toronto Maple Leafs 3-2. Buffalo has won two out of three games against the Leafs this season. Buffalo defeated the Nashville Predators 7-4 on Saturday. Sabre's defenceman, Victor Antipin was illegely hit into the boards by Nashville's Scott Hartnell and suffered a concussion. Hartnell got a five-minute major penalty for the hit. Buffalo scored three times on the five-minute power play. Sabre's Jack Eichel got five assists in that game. As for the Leafs, the team lost to the Winnipeg Jets on Saturday 3-1.